Did you know there’s an easy way to get together once a week with other professionals to talk shop for an hour without leaving your office? If you’re shy or tired, you can sit back and listen. No one will mind, in fact, they won’t even know. And if you can’t be there, you can read a full transcript later. I’m talking about Twitter chats. There are 210 regularly scheduled chats, according to the Google table created by Robert Swanwick. Each Twitter chat has its own identifying hashtag, like #assnchat. Yes, I realize that hashtag may be considered “not safe for work,” but those of us in the association community have come to love it. It’s easy to participate in a Twitter chat. I use my regular Twitter application (Hootsuite or Tweetdeck) to create a search column for the hashtag. You could also use TweetChat, Twebevent or Tweetgrid – applications specifically made for Twitter chats. Or you can follow chats using the search function in your mobile Twitter application. Everyone who participates adds the chat hashtag to the end of their tweets. The search function in your application will only display tweets that include that hashtag. If you miss a chat, transcripts can be found on What the Hashtag if you log in Tweetdoc (What the Hashtag no longer exists). Some chats are also archived on Twapper Keeper. In a Twitter chat you will meet others who share your profession or interests, pick up new ideas and perspectives, share a laugh and sometimes find answers to problems. Here are some of my favorite chats. All times are for the Eastern Time zone. #blogchat – Sundays at 9:00 p.m. This wildly popular chat, hosted by Mack Collier, can be overwhelming as several thousand tweets fly by in an hour. However, it’s worth dipping into as it covers all facets of blogging. Don’t expect to read all the tweets, just read what you can. The October schedule is posted on Mack’s blog. #assnchat – Tuesdays at 2:00 p.m. Started in the spring of 2009 by Jeff De Cagna for the association management community, #assnchat is moderated by Kiki L’Italien. Recent topics were online communities, HR and social media and diversity. Many ideas and friendships have blossomed from #assnchat. The hashtag is also used to mark blog posts of interest to the association community. #fnichat – Mondays at 4:00 p.m. I sat down for a recent Foodies’ Night In chat with a growling stomach only to learn the chat was about cheese. Oh the humanity, talk about cravings! It’s a well-organized and friendly chat. #wclw – Last Wednesday of the month at 11:30 a.m.
WordCount Last Wednesday is for independent journalists, bloggers and freelancers. Guest speakers discuss tech tools for writers, writing and freelance business issues. The last chat was about Facebook pages for writers which was a little too basic for me, but helpful for others participating. 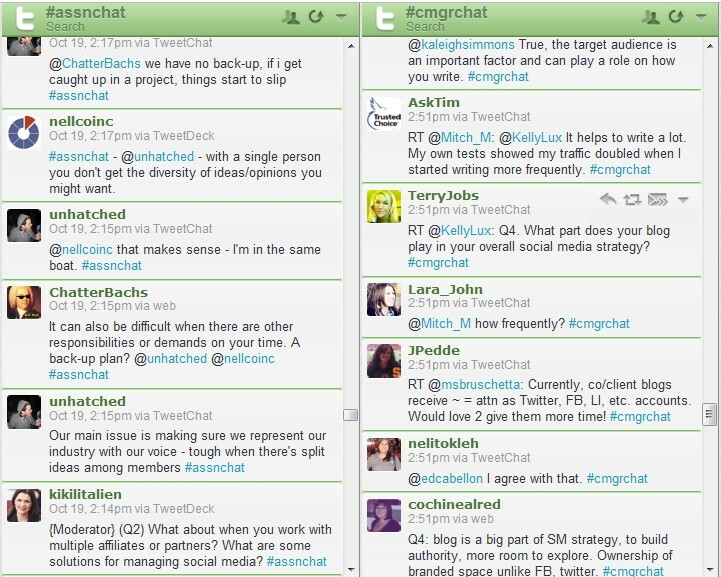 #cmgrchat – Wednesdays at 2:00 p.m. If you want to learn more about managing online communities, this new chat for community managers provides tips and advice. There are summaries of past chats, including topics like time management and handling negativity, on their blog. #u30pro – Thursdays at 8:00 p.m.
Ok, you got me, I don’t participate in this one, I’m too old, but I’m all for spreading the love. If you’re under 30, join their community and receive a weekly update at David Spinks’ blog. #eventprofs – Tuesdays at 9:00 p.m. and Thursdays at 12:00 p.m. I don’t participate in this chat for event professionals, but I know many who do. Recent discussions include overcoming barriers to conference participant engagement and making social an integral part of event strategy. The schedule is posted on their chat wiki. #bakechat – Mondays at 9:00 p.m. – covers the professional and lay-person world of baking, pastry and desserts. #writechat – Sundays at 3:00 p.m. – discusses writing and the writing life. #foodchat – 3rd Tuesdays at 8:00 p.m. – brings consumers together with agriculture to bridge the farm gate to the consumer plate. Which Twitter chats do you enjoy? Thanks for the mention of the list and the shout-out. For anyone running a chat I recommend twebevent. They can just add their hashtag without the ‘#’ to the end of http://twebevent.com/ and the app will walk them through setting up a landing page. You’re welcome, Robert. Thanks for starting that Google doc. It’s amazing how it’s grown over the past year or so. I like that you can count the lurkers with twebevent. It would be interesting to see how big of a percentage they are on chats like #assnchat. Thanks for commenting! Thanks for sharing such a great list! Will have to add these to my calendar!